These earrings are made out of 14K white gold and amethyst stone. They have a natural heart-shaped 6mm amethyst gemstone; so undeniably, these are very elegant stud earrings. The part that is made out of white gold is impeccable, and the stone itself has a radiant and brilliant purple color. The back is made out of sterling silver v they are perfectly secure because of the push-back finding, so no need to worry that they will fall off. With their dazzling design, they are a perfect gift for every girl. They are perfect to wear whatever the occasion is because they can brighten up and complement your everyday look or make your elegant style more interesting, fashionable, and youthful. You will love them and eventually, they will soon become a part of your everyday wear. Buy them as a gift for women or as a treat to yourself! 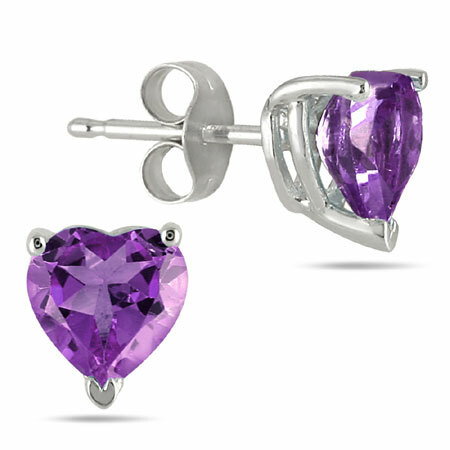 We guarantee our Natural Heart-Shaped Amethyst Earrings, 14K White Gold (6mm) to be high quality, authentic jewelry, as described above.